England sealed a hard-fought four-try 35-15 victory over Japan to get back to winning ways and seal a second win in their November Quilter Internationals. Japan came out the blocks at a ferocious pace in the first half leaving England down 15-10 at the break despite taking an early lead through Danny Care’s converted try. Japan got back into the game with Yu Tamura’s penalty while Ryoto Nakamura’s converted try gave them a 10-7 lead. Elliot Daly’s penalty levelled the score before Michael Leitch powered over for the Brave Blossoms. Second-half tries from Mark Wilson, Joe Cokanasiga and Dylan Hartley as well as 10 points from the boot of George Ford secured victory. 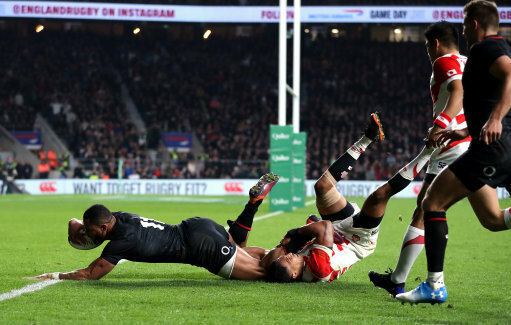 With a first start for Zach Mercer and debuts for Joe Cokanasiga and Ted Hill from the bench, the England side had a relatively fresh feel to it and the giant Bath wing Cokanasiga needed no time to assert himself on proceedings. Having collected a ball on halfway, he powered down the left wing before passing inside to Jamie George who fed Care for an easy run in for his 14th International try. 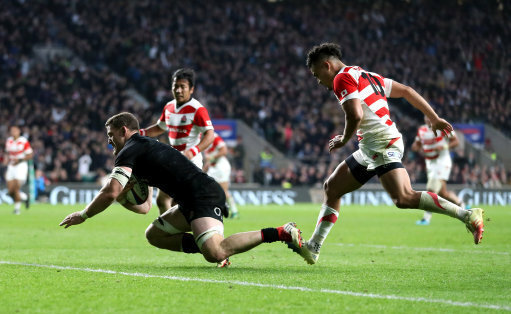 Japan were back in the game through Tamura’s penalty and after George was sin binned following a sustained period of ill-discipline from England they also had a try as centre Nakamura scythed through after being fed from a 5m scrum. Daly landed a penalty from halfway but England struggled to assert themselves on their opponents, with Leitch giving Japan a five-point lead at the break, powering through three tackles to score. Owen Farrell was introduced after half-time, replacing Alex Lozowski while Henry Slade was also an early replacement following a 30th minute injury to Chris Ashton and England dominated the second period. Ford, on his 50th appearance, reduced the deficit to two points with a penalty and he created England’s second try, throwing a nice inside pass to release Wilson to go over for a first international try, which the Leicester Tigers fly-half also converted. A further three points from the boot of Ford stretched the lead to eight points as the game became increasingly stretched. Cokanasiga finished off Richard Wigglesworth pass inside, showing power and dexterity of handling to stretch over for a first international try. And from one debutant to another, Hill came on with five minutes left and he helped play a part in their fourth try as Hartley bundled over off the back of a driving maul as England's forwards powered over Japan's line in the final action of the game. England will need to put out their 'A' team next week against Australia at Twickenham Stadium on Saturday in the final Quilter International.